Last week's return of Howard Stark (Dominic Cooper) on Agent Carter highlighted the new lighter tone of humor to the show since it moved from New York City to Los Angeles in season 2. However 'Better Angels' also saw a return to the basic premise of Agent Carter season 1, with Peggy Carter (Hayley Atwell) working against the SSR rather than with her fellow agents - though the villain of season 2, Whitney Frost (Wynn Everett), has already proven to be a strong antagonist. In 'Smoke & Mirrors', written by Sue Chung and directed by David Platt, we learn more about how both Peggy and Whitney came to be the women they are in Agent Carter season 2. In the present, Peggy enlists Edwin Jarvis (James D'Arcy) to kidnap a security officer from the Arena Club, Rufus Hunt (Chris Browning), that they realize to be the man who attacked Peggy. However, when Peggy brings Rufus's information to SSR Chief Sousa (Enver Gjokaj), they're prevented from raiding the Arena Club by Vernon Masters (Kurtwood Smith) of the War Department. The true highlight of 'Smoke & Mirrors' is undoubtedly the parallel origin stories of Peggy and Whitney, told through various flashbacks to their childhood and young adulthood. Peggy, for her part, wasn't always the field agent that was introduced in Captain America: The First Avenger despite wanting adventure as a child. She grew up to want what women in the early 20th century were raised to want: a quiet life and a husband. While working as a code breaker at Bletchley Park, Peggy was forced to choose between her fiancé and a job offer as a field agent with the Special Operations Executive. She finds out her brother, Michael (Max Brown), recommended her for the job and he expresses his concern that she's not being true to herself by choosing to settle down. Peggy stays resolute in getting married until she receives news that Michael died in the war and she leaves her fiancé to take the job with the SOE, setting her on the path to becoming Agent Carter. Though Peggy's back story effectively gives the character a new depth, painting her in a new light as someone willing to go with convention rather than fight against it, this storyline largely holds little weight since we know how the story ends. Meanwhile, Whitney grew up as Agnes Cully in Broxton, Oklahoma, with the ability to fix a radio even at a young age. Her mother, Wilma (Samaire Armstrong), however, uses her looks and charms on a man in order to provide for herself and her daughter. But, when Wilma gets older and the man leaves her for a younger woman, she blames Agnes' poor attitude when "Uncle Bud" told her "Y'know, I bet you're real pretty when you smile." Wilma teaches Agnes that her only true asset is her beauty, not her intellect. The sentiment that Agnes would be more beautiful if she smiled is echoed by a talent agent later in her life when she's living in Hollywood, who discovers her and sets her on the path to becoming Whitney Frost. Peggy's story may be entertaining in its own right, but Whitney's back story packs more of an emotional punch as the viewer watches while she isn't afforded the same choices that were granted to Peggy, and is instead taught to go with what convention tells her - to smile in order to please a man. This is a command that rings true even with modern women and makes Whitney's story all the more relatable. This theme in 'Smoke & Mirrors' is reminiscent of Jessica Jones' season 1 antagonist, Kilgrave, who became one of the Marvel Cinematic Universe's best villains because many viewers could relate to knowing or interacting with someone like him at some point in their lives. Agent Carter doesn't delve as deep into Whitney's back story as Jessica Jones did with the relationship between Kilgrave and its heroine, but enough is shown in 'Smoke & Mirrors' that the viewer can understand how Whitney became a woman who craves her own power when most of her life she has been dependent on the power of a man. Unfortunately, the rest of this episode of Agent Carter pales in comparison, in terms of character development especially, to the flashback segments. But, the show continues with its lighter and more enjoyable tone of humor in 'Smoke & Mirrors' that has helped to add more depth to the serious scenes of Agent Carter by juxtaposing them with jokes. However, many jokes or gags are at odds with the characters themselves, like Peggy failing to hide the fact that she has Rufus trapped in the trunk of her car from Sousa despite the fact that she is a trained spy. Still, Atwell carries these moments off with enough charm that viewers can forget her shortcomings when attempting to lie to a friend. Additionally, D'Arcy continues to pull off the more silly humorous moments, such as his exclamation of "Jarvellous" when he's hit with a tranquilizer dart. On the more serious side to 'Smoke & Mirrors', Peggy and Sousa hit a bureaucratic roadblock in their investigation into the Arena Club when their raid is prevented by Vernon Masters. He attempts to manipulate both agents to his way of thinking - just as he seemed to do with Jack Thompson (Chad Michael Murray) - and get on board with the fact that the SSR is "going the way of the dinosaur." But, while Jack represents a more gray moral compass, Peggy and Sousa predictably recognize Vernon's loyalties as being with the Arena Club and its Council rather than with justice. With further revelations from Rufus that the Council has ties to all the important people in society, whether in politics or elsewhere, it's difficult not to see Vernon as an early version of the Agents of S.H.I.E.L.D. and Captain America: The Winter Soldier antagonist organization Hydra - especially given the resemblance between the Arena Club's pin the historic symbols of Hydra seen on S.H.I.E.L.D. 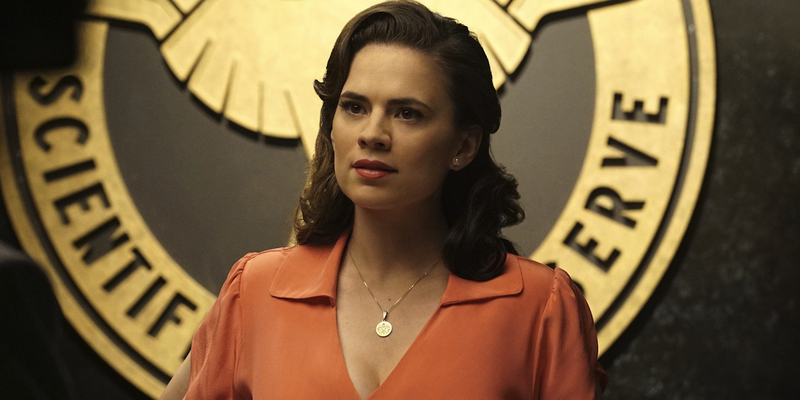 Of course, Agent Carter will eventually depict the creation of the S.H.I.E.L.D. organization and because of The Winter Soldier the audience knows Hydra was hidden in plain sight throughout its entire existence. Still, knowing that there is one battle Peggy won't win gives this storyline - whether or not it is Hydra - higher stakes. In episode four of season 2, Agent Carter has found a mostly acceptable balance between humor and seriousness. There are still some bumps in the road with the show leaning more into its humor at the detriment of its character development at times, but Agent Carter has proven to a be an even more enjoyable show in its second season, especially when giving its characters - like Peggy and Whitney in the flashbacks of 'Smoke & Mirrors' - time to grow into and explore their roles as the hero or the villain. Although Agent Carter season 2 is still largely following the same premise of season 1 (Peggy Carter against the world), adding Sousa to the team and giving an even more sinister edge to the SSR brass - rather than the too simple reasoning that they're sexist - offers enough of a fresh take that it doesn't come off as retreading the same path. Plus, with potentially wider universe implications in the Vernon Masters storyline, perhaps having ties to Hydra, Agent Carter is not only providing a more enjoyable season in its own right, but a more connected one to the larger MCU as well.